Everytime I have leftover whipping cream, there's no questioning about how I am going to use it! Ah yes, Panna Cotta has always seemed to be the right choice of dessert! Super creamy, light and perfect for any occasion, or rather, you don't need an occasion to have Panna Cotta!! So far, I've made only two Panna Cottas - Panna Cotta with Red Berries Coulis and Yogurt, Honey and Vanilla Bean Panna Cotta with Passion Fruit Gelée ! 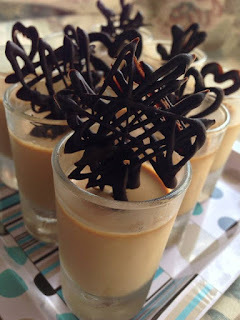 And yesterday, I thought of making a flavoured Panna Cotta, and since I love coffee, though I tend not to have it often, it was the winning flavour amongst chocolate, passion fruit, and vanilla! Like I have mentioned before, you need no special equipment nor any special skills to make this incredibly luscious and velvety dessert! I like making them in shots, but you are free to use ramekins, tumblers, martini glasses just any glass you'ld like!! Combine milk and whipping cream together in a small pan. Sprinkle gelatine powder over milk and let bloom for a few minutes. Using a whisk, blend the milk mixture well with gelatine powder. Over medium heat, bring the milk/gelatine mixture to a simmer until all the gelatine has dissolved. Then, add all the other ingredients - sugar, vanilla extract, and coffee granules. Take pan off the heat, and pour the mixture in a beaker! And divide the mixture equally in the 12 shots. When you are about to serve the panna cotta, prepare the ganache by slow boiling the cream in a pan on low heat or by microwaving it for 40-60 seconds. Throw in the chopped chocolate squares. Allow to stand for a minute and then stir to melt completely. 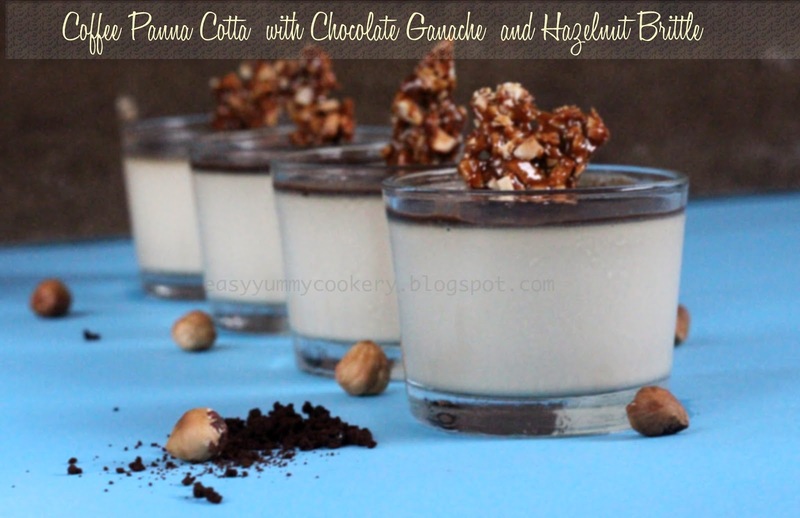 Drizzle over panna cotta! Prepare a baking sheet lined with parchment paper or a silicon baking mat. Set aside. In a pan on low heat, let the sugar melt completely without stirring. Do NOT insert any spoon, metal or anything. Swirl the pan but do not stir! Do not walk away, you'll be sorry! When the sugar turns a golden brown colour, toss in the chopped hazelnuts. Swirl to mix. Rapidly pour the caramelised hazelnuts onto the baking mat while using an offset spatula to spread and even out. Allow cooling for a good 15 minutes and snap into pieces! Now, top your panna cotta with those beautiful brittles!! Voila, your Panna Cotta is ready!! 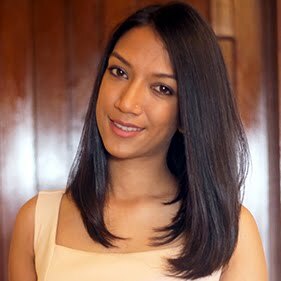 You can either make the hazelnut brittle just before serving the panna cotta, like half an hour before or days ahead - if you are preparing this ahead, make sure you store the brittles in an air tight container. Beautiful pannacotta, coffee that is calling my name. Thank you Swathi ;) I dont blame you, coffee is such a flavour! Looks amazing! Thanks for the share, will definitely give it a try when I have some spare time!